Gopher tortoises are long-lived reptiles that occupy upland habitat throughout Florida including forests, pastures, and yards. They dig deep burrows for shelter and forage on low-growing plants. Gopher tortoises share these burrows with more than 350 other species, and are therefore referred to as a keystone species. More About: Conservation of gopher tortoises depends not only on the efforts of FWC and other conservation groups, but also on Florida's citizens. There are many ways to co-exist with these gentle lands tortoises. 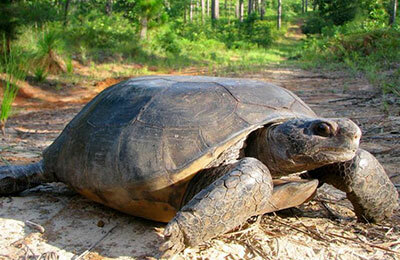 Diet: Gopher tortoises are herbivores. They eat grasses, the flowers, fruits and leaves of herbaceous plants and shrubs like asters and legumes, daisies, clover, peas, cat briar, blueberries and palmetto berries, as well as stinging nettle, prickly pear cactus and pine needles. Because they get water from plants and dew, tortoises rarely drink water. Population: The majority of the remaining gopher tortoises are in the state of Florida where the population was estimated in 2003 to be under 800,000, but in steep decline.